I’m ready to support you to begin the process of reclaiming your Feminine sovereignty. Intuition, creativity and wisdom devoted to you and how you want to reclaim your feminine sovereignty. In this Transformation Goddess Coaching Circle, I will share practical tools to help you release blocks and gain self confidence. I promise to provide a safe haven for self-study, compassionate self-care, and feminine ritual from the comfort of your own home. Join me for this intimate coaching circle (only 4 seats available) if you want to be fully supported through a soulful exploration of your precious life. If you want to wake up each day feeling good about yourself. Energized. Happy. Peaceful. If you’re ready to shed the layers of protective armor wrapped around your heart, this supportive digital offering is for you. How does three months of loving support, mentoring, sister-guidance, and deeply personal introspection sound to you? How does shouting from the mountain top, “I’m ready to claim my feminine power and transform my life!” feel to you? 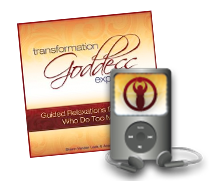 The private, one-on-one Transformation Goddess Experience was created specifically for creative, seeking, courageous women who are READY to dig deep and transform their lives.